The Oasis International School, Cairo welcomes children from age 3 to 18 and follows the International Baccalaureate. It is a French speaking school, with English and Arabic taught from age 4. Maximising Learning have been working with the school to help them develop a whole school approach to outdoor and adventure learning, looking at philosophy, strategy and training. Early in 2014 Jim delivered some initial CPD on outdoor learning within the school grounds to the PYP teachers. Anita returned in the Spring to work with the Primary teachers and children as part of their Adventure Learning Week. 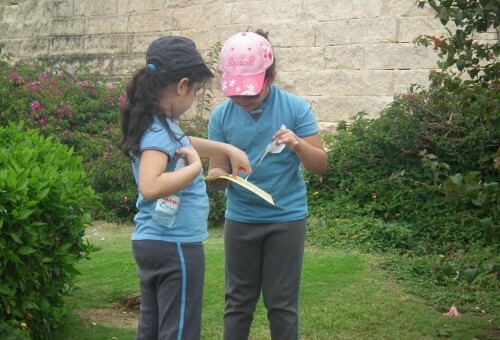 The teachers wanted to take their outdoor learning further afield, taking all the PYP children on an off-site visit. However it was important to use this experience as a learning opportunity for teachers and pupils alike. Al Azhar Park is a large park in the centre of Cairo created on the site of a former rubbish tip, and provides a wide range of learning opportunities for all ages. With over 400 pupils in the PYP the school decided to visit the Park, but split the visit into two days. Prior to arriving in Cairo, Anita developed a range of activities, linking to language, maths, science and art, which could be used by the teachers during the visit. These could be carried out as standalone activities, or linked to form a trail of activities around the Park. They were also designed so that they could be used at a range of locations, including in the school grounds. Differentiated and follow up activities were also included. The first day of the training was spent with representative teachers at the Park to recce the site and try out the different activities. This also gave the whole group an opportunity to consider any logistical requirements. Back at school the teachers met with their year group colleagues to plan and tailor the activities they would do with the children on the visit. 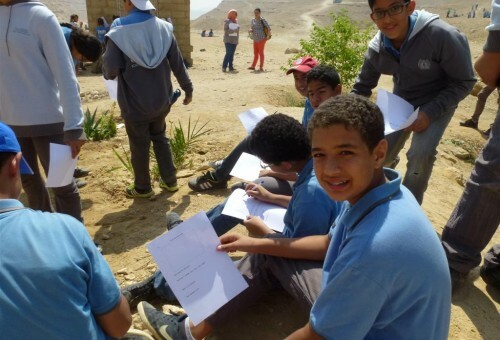 The following two days saw the Al Azhar Park awash with children from the Oasis School, with classes exploring different parts of the Park through language, sound, shape, colour and texture, engaging in activities closely linked to the curriculum. The feeling that permeated through the whole visit, and the Park itself, was one of fun and enjoyment, with pupils fully engaged in their experiences and learning. This was the first time the school had taken such a large group on such a visit. This ‘on-the-job’ off-site training built upon previous on-site training, and allowed teachers to try out new activities with the children at the Park while also being able to address the logistical challenges of such a trip. They could also explore how such visits could link to and enhance the daily curriculum. We helped Oasis International School achieve their goals. Get in touch now to find out how we can help you reach yours.